If you want an Android tablet, finding a good deal on one is not difficult. In fact, I don’t know why anyone would pay full price for an Android slate at this point. Whether it’s something from Samsung or the latest Nexus tablet from Google, someone is bound to have a discount worth considering. 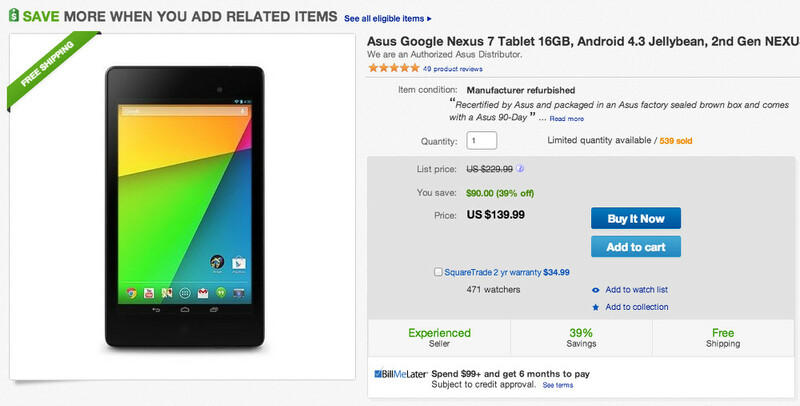 Take today’s deal on eBay for example, where you can grab a refurbished 16GB variant of the Nexus 7 (2013) for $139.99. The device originally retailed for $229 in a “brand new” state, but thanks to the manufacturer having to tinker with it, you can save $90. The Nexus 7 (2013) may be almost a year old, but it is still widely considered to be one of the best available.